Save money and stay in control with INTEGRA Control – the unique, groundbreaking real-time application control service from Applied Satellite Technology Ltd (AST). Available exclusively from AST, INTEGRA Control provides a revolutionary, cutting-edge service allowing complete visibility, control and reporting of application categories and data used over satellite networks. The service enables customers to block/limit unwanted traffic by individual application categories and control their bandwidth usage to maximise efficiency and costs. All AST customers are provided exclusive snapshot views of application, protocols and data usage at any time as a standard offering via My AST Portal. INTEGRA Control offers innovative, superior functionality and capability, allowing complete control over satellite services. 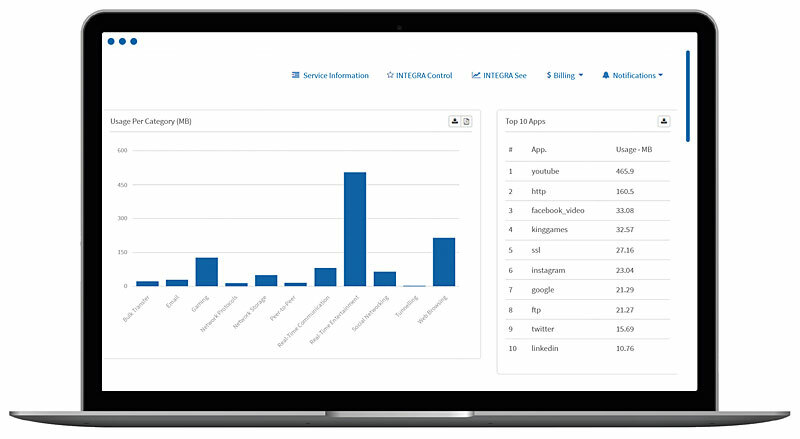 By upgrading to INTEGRA Control, information is expanded into granular detail enabling powerful insights into data usage and enables users to; set alerts/limits on usage across individual categories, the ability to block categories and applications, (including encrypted apps such as WhatsApp), and much, much more. You have to see it to believe it. If you seriously want to save money and take back control of your data usage on your satellite networks then AST INTEGRA Control is a must have service for all satellite users. INTEGRA Control is now available to purchase through any of AST’s global offices.